I've been plotting and planning a CNC conversion for my 9x30 lathe for some time now. This page chronicles the journey as well as the ultimate destination. Project Introduction: What do I hope to accomplish and how am I planning to get there? This is a brief history of how I got into this mess in the first place. 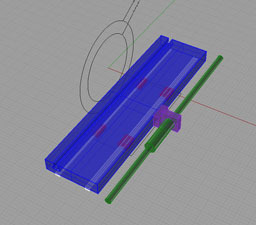 Also discusses the E-Leadscrew idea. 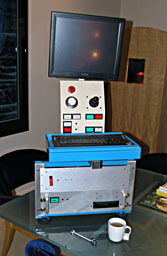 Driver Enclosure and Swingarm Rack: 19" Rack Enclosures for PC and Driver Electronics and a swingarm for the LCD touch panel, keyboard, and lathe control panel. Step Motors and Mounting: Basic direct drive mounts for NEMA 23 step motors. Machine Tool Accuracy: Results of my research on factors governing accuracy for CNC conversions. Rack Mount PC: I built an Athlon 64 system that goes in a rackmount enclosure to match the driver electronics enclosure. Optical Limit Switches: Wherein I design and build my own limit switches based on a slotted optical switch. Driver Electronics: DC Power Supply, Breakout Boards, Gecko Drives, and the rest of what's needed on the electrical side. To Do: My tracking list of what I need to do next to move the project along. It ebbs and flows. Control Panel: A design for a lathe panel that maximizes opportunity for manual as well as CNC control. Software: Much is driven by the choice of software! Mach 3 Notes and GRex : My notes GRex and Mach 3. Ballscrews & Gang Slide: Once the basic lathe is up and running, the next step will be some upgrades like these! 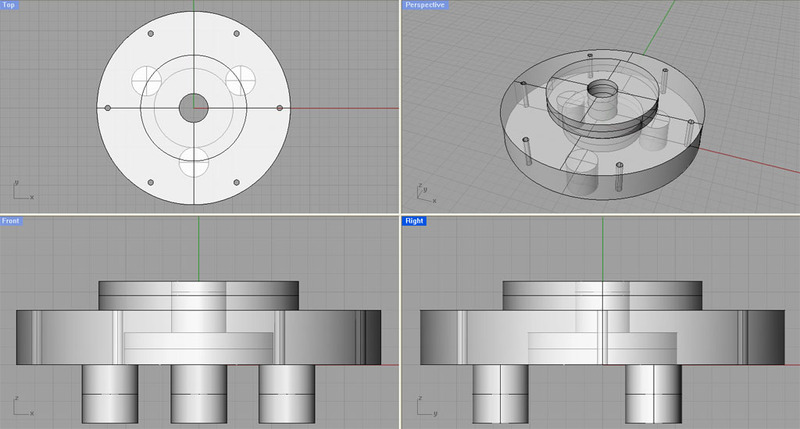 I couldn't resist, my first CAD drawing in Rhino 3D of a chuck backplate. Made within 1 hour of receiving my official copy!